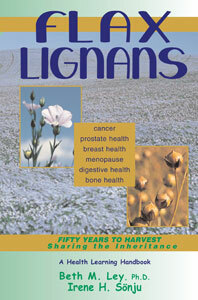 Lignans are phytonutrients found in unrefined grains, legumes (such as soy beans), certain vegetables and seeds. Flax is the richest source of lignans, providing 75 – 800 times more lignans than most other plant sources. Lignans are phytoestrogens, or naturally-occurring plant estrogens, that can have a balancing effect on hormones in both men and women. Lignans also exhibit strong antioxidant activities which helps prevent aging and ward off cancer. PLUS: Important news about lignans and probiotics (the good bacteria) to fight off cancer (and the dangers of antibiotics) EVERYONE needs to know about!